Since being forced to join the Soviet Union as Republics during World War II, the Baltic states of Estonia, Latvia, and Lithuania had desired independence. These states had their independence during the early 20th century for about 20 years but were forced to be under Soviet rule once again because of the power of the Red Army in 1944. Losing independence and being forced to remain under the Soviet Union for over 40 years is shocking as the Baltic states all had strong Anti-Soviet movements that did not support any of the Soviet policies or the Russification of their lands (Siegelbaum). Because of this, these states obviously resented being forced back under the rule of the Russian power and took the first opportunity they had to achieve independence. 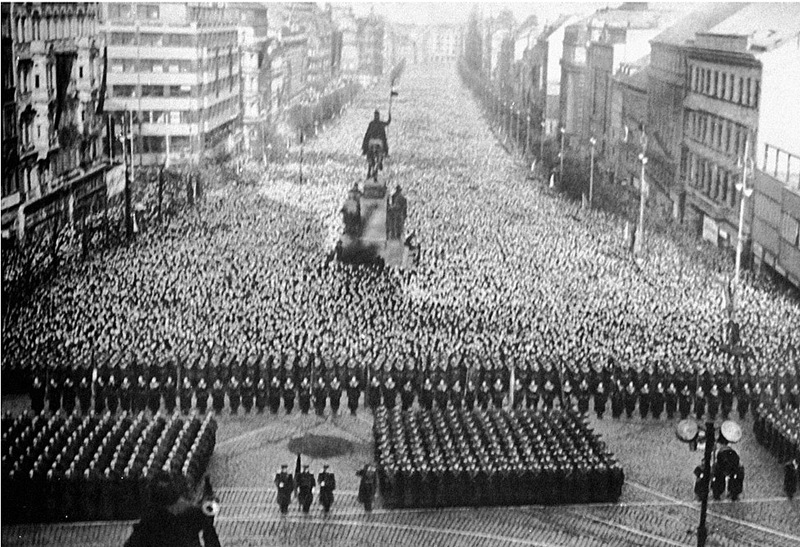 As the power of the Soviet Union decreased throughout time the Baltic states gained ways to protest due to the changes in Soviet leadership and their policies. Mikhail Gorbachev’s policy of glasnost allowed for the Baltic states to achieve their independence as it focused on promoting transparency between the government, the people, and the international community. Glasnost allowed for the people to push for independence as they were able to highlight their unwillingness to remain a Soviet Republic and their desire to be their own nations. (Geron, 135). Glasnost allowed for resistance movement to develop and expand in the Baltic states as it gave a form of legitimacy to their independence movements. Following the use of glasnost to push for the will of the people, referendums were held for the people of the Baltic states to vote on if they should leave the Soviet Union. The first referendum was held in Lithuania on February 9, 1991 where 90.5% of the voting age population stated that they wanted to leave the Soviet Union. The following referendums in Estonia and Latvia on March 3, 1991 had similar results with 77.8% and 73.7% of the eligible voting population respectively voted “yes” independence (Geron, 135-136). The most interesting and important part of the Baltic independence is their unity during this process. All three nations have held different cultural, linguistic, and historical backgrounds, but worked together in 1989 to form the human chain for independence. One Soviet newspaper published on September 20, 1989 focused on the Latvian move for independence and the Board of the Duma of the Latvian People’s Front. 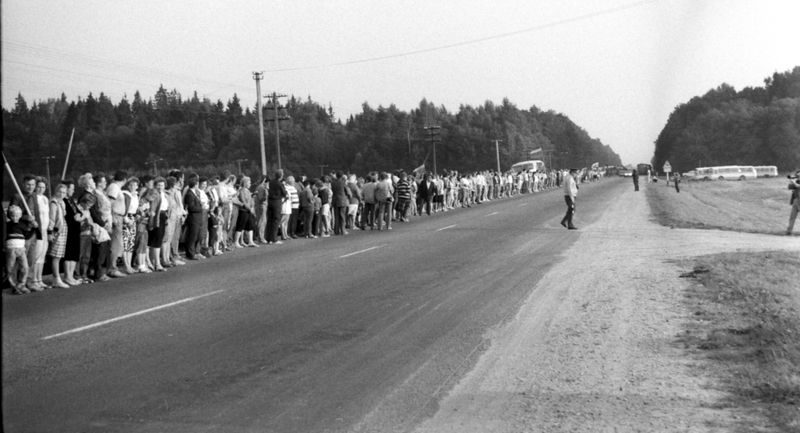 This national movement wanted to reaffirm the desire of the Baltic people, “to be independent again and to regain their statesfree Estonia, free Latvia and free Lithuania (Mass Action in the Baltic Republics).” To do this, around 250,000 Latvians came to join a living human chain that joined together with Estonians and Lithuania that stretched over 600 kilometers from Tallinn, Estonia to Vilnius, Lithuania. This human chain was done on the 50th anniversary of the signing of the non-aggression pact between Nazi Germany and the Soviet Union. The non-aggression pact allowed for the USSR to formally annex the Baltic states and having the demonstration of the human chain on this day served as a symbol of their desire to secede from the nation that had forcefully placed it under its rule. Because of the history of the Baltic states with foreign invasion and Russia, they were very Anti-Soviet. This is the reason they were the last region to officially join the Soviet Union, and the first to declare their own independence in August, 1991 (Freeze, 462). Freeze, Gregory L. Russia: A History, Third Edition. Oxford: Oxford University Press. 2009. Throughout history sports have been a way for nations to come together in celebration of a joint athletic spirit and the ability to demonstrate their national pride. While many Olympic Games have been rooted in controversies such as drug and doping scandals, the 1980 Olympics held in Moscow, had to face mass boycotts from foreign nations. This boycott by numerous nations was the political response to the Soviet Union after its invasion of Afghanistan in December 1979. The Soviet invasion of Afghanistan was done because of the region’s importance to international politics and Afghanistan’s positive relationship with the United States (Freeze, 446). This Cold War tactic by the Soviet Union did not just end terribly because of the resulting war that consumed a large amount of military resources such as soldiers and arms, but also because of the irreversible effect it had on the Soviet’s international image. The Olympic Games have traditionally been an event set to demonstrate the best athletes from every nation and give a rise in the feelings of nationalism (Siegelbaum). The Olympics were, and still are, perceived to be an event a nation should be proud to host because of the international recognition and ability to demonstrate its culture to people around the world. The 1980 Moscow Olympics was set to do this as previous hosting nations had done, except they had to contend with the politics and influence of the United States President, Jimmy Carter. President Carter was of course deep in the middle of Cold War politics and had to find an appropriate respond to condemn the actions of the Soviet Union. As economic sanction were not likely to do anything to drastically effect the Soviet Union and political sanction had been unofficially in effect for years at this point, boycotting the Olympics as a political protest was the only solution. It was a solution that President Carter was forced to come to because of the domestic pressures caused by his goal of getting reelected and the upcoming elections in key parts of the U.S. that his party could not afford to lose (Lucler). President’s Carter’s decision to boycott the 1980 Olympics was originally rejected by many Western European nations, as they did not see the Soviet Union’s invasion of Afghanistan as being any different than other political actions. These nations would commonly cite the United States’ international actions and its participation in the scheduled Olympics in 1968 as hypocritical (Lucler). African nations, and the majority of the Third World, also saw the hypocrisy in the actions of the United States as they had attempted to do the same thing during the previous Olympics in 1976 to protest against the racism policies of South Africa. It is important to note that when asked about this plan, that the United States stated that the Olympic Games should not be used for political protest (Lucler). The Olympic boycott was obviously not received positively in the Soviet Union, as they viewed it as an attempt spearheaded by the United States to undermine the purpose of the games and the Soviet Union. Because of this, the Soviet media was given permission to comment against the statements and propaganda of the West (Siegelbaum). For example, Pravda wrote in March, 1980 that, “Washington does not hide the fact that the campaign aimed at wrecking the Olympics is being pursued for strictly political ends. What Carter and his “team” need is not a coming together of individuals and peoples, which the Olympic movement promotes, but division, disunity and tension (Olympic Boycott).” The journalists focused on how the boycott was a political move that would serve President Carter’s ambitions instead of allowing for the world to come together and have a few weeks of relative, non-political peace. The same newspaper article would go on to quote Al Feuerbach, an American athlete where he stated that, “I am 100% against staying out of the Games,” to show that President Carter’s suggestion was unpopular within his own country, not just abroad (Olympic Boycott). A Soviet Union newspaper rejected the idea that the Olympic boycott would be successful in June, 1980 when it focused on the number of participating nations. This article states that days after the deadline for submitting applications to attend that 85 nations would participate in the Moscow Olympics. This is despite the American-supported boycott that had great influence over many nations. Despite being American-backed, only 29 nations stated that they would not attend the Olympic Games, with 19 of those nations citing non-political reasons for their nonparticipation (“To the Moscow Olympics).” With these reports and millions of tickets sold, the Moscow Olympics were a success despite the American attempt to force it into becoming a failure. 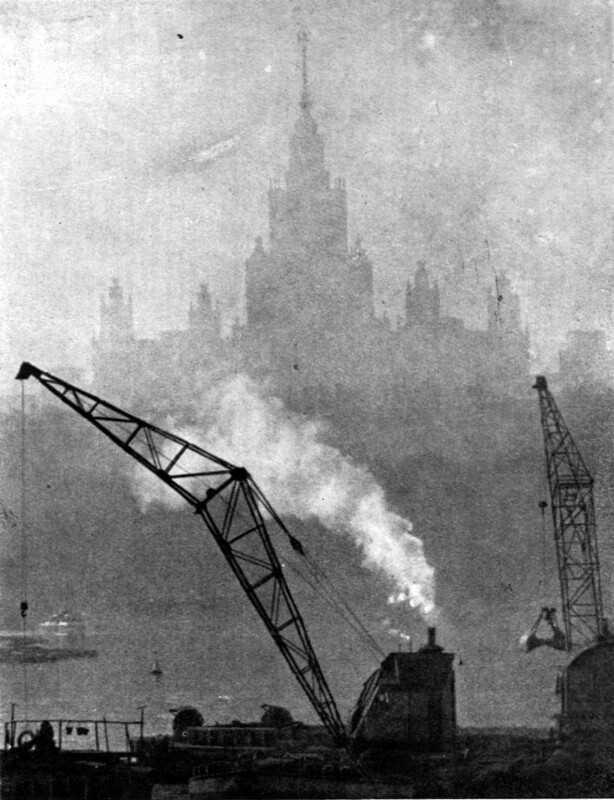 Following the industrialization of the Soviet Union in the mid-20th century, many people moved to cities in search of work and opportunities. This mass migration to urban areas such as Moscow and the population boom that occurred resulted in a housing shortage that left many homeless with the lucky few being forced to live in communal apartments. With Joseph Stalin’s death in March 1953 his successor, Nikita Khrushchev, wanted to distance himself Stalin’s legacy and the politics that surrounded him. To do this form of destalinization, Khrushchev wished to connect with the common people and afford them the right and ability to move away from the shared living situations that afforded to them little privacy. Thus, Khrushchev implemented numerous housing projects that rapidly expanded the boundaries of urban centers and increased the number, size, and standard of apartments across the Soviet Union (Morton, 235). Despite these seemingly improvements in housing, the changes were not all that positive compared to the standards of living in other countries. These so called “Khrushchev barracks” had low ceilings, small rooms, and shoddy and fast construction (Freeze, 425). The result of such homes and standards of living left many Russian citizens wanting to escape from their encompassing and overcrowded lives to a more natural and free environment. 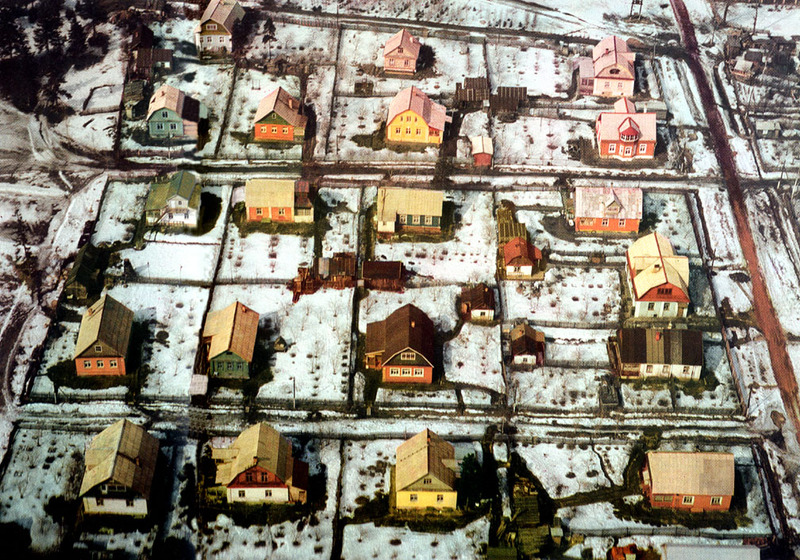 To find such a retreat from the urbanized areas such as Moscow, many Russians sought out dachas, or summer houses to either rent or own for a duration of the year. These countryside vacation homes were largely state-owned and operated in the rural areas untouched by industrialization and development (Geldern). They served the purpose of allowing Russians to receive fresh air they could not get in large cities and reunite themselves with nature and the rural territories that many of them had grown up in. Despite their popularity and appeal to large amounts of the population, there were not many dachas in existence. This is the result of good land being used for agricultural purposes under Khrushchev with his “Virgin Lands” program, where farmable land was taken and used as state-farms because of their history of never previously being used (Freeze, 424). As there were a limited number of dachas available for rent, the search for them began early in the year, sometimes as early as January. Dachas were also divided along the signs of wealth and status with politicians and the elite owning private summer houses equipped with servants and other forms of luxuries. The average man on the other hand was forced to rent a summer house for a considerable price while also facing the risk of having his stay be double-booked with other families. This risk was serious as there was no agency to protect against this from occurring, or even a government department that oversaw the renting and regulations of dachas (Dashkevich, 18). In fact, many of the existing regulations only existed on paper. The process of renting a dacha is primarily done between the owners and the renters of the summer houses, with the Soviet government rarely being involved in the process (Morton, 248). This directly affects the pricing of the dachas as there were no strict and enforced regulation for renters to base the prices off of. The non-existent regulations combined with the growing demand for dachas and their small quantity forced many Russians to overpay for their accommodations. On March 5, 1953 Soviet Russian leader Joseph Stalin died after suffering from a brain hemorrhage 4 days earlier. Stalin, who rose through the ranks under the leadership of Vladimir Lenin and became the leader of the Soviet Union shortly after World War I in 1922, left behind a government that faced the difficult task of choosing a new leader among the various qualified and ambitious statesmen (Siegelbaum). This issue of succession would ultimately decide the course the Soviet Union would take during the global strife of the Cold War, and would result in changes in Soviet life, economics, and government because of the mass reforms made by Stalin’s successor (Freeze, 408). Unlike Lenin who chose his successor, Stalin, before he stepped down in 1922 and his death in 1924, Stalin did not leave behind a clear indication of who was to succeed him (Bociurkiw, 576). This problem became apparent while Stalin was on his deathbed and during his funeral, where the three main possible successors, Georgii Malenkov, Lavrentii Beria, and Nikita Khrushchev each promoted themselves as the possible heirs to Stalin. This self-promotion began while Stalin lay dying as the main three divided themselves into a “collective leadership,” where each would be given a different form of power that would allow for them to be seen as equals. This leadership style saw Malenkov being named the new chairman of the Council of Ministers, Beria as the continued chief of the Soviet secret police, and Khrushchev as the new top secretary of the Central Committee (Siegelbaum). “Collective leadership” allowed for the men who distrusted one another, but trusted one another’s desire to preserve the regime to work together to fill the vacated, demigod-like role Stalin left (Bociurkiw, 578). This “collective leadership” the three leaders were placed did not last long as each began to make a grab for complete power as the head of the Soviet Union. This began at Stalin’s funeral, where Malenkov and Beria gave speeches about Stalin and the glory of the Soviet Union. They were two of the three speakers at the funeral in addition to Vyacheslav Molotov, Stalin’s longtime friend and protégé (Freeze, 409). It is notable that Khrushchev did not speak at the funeral of Joseph Stalin, as such an honor was reserved for high-ranking statesmen. This fact could have also been representative of Khrushchev’s lower position in the triumvirate-like Soviet leadership, but was not the case. "Crowds in Line to View Stalin's Body (1953)." Death of Stalin, 1953. 2001. Following Stalin’s funeral, all three potential successors began to call for changes and attempted to gather support from the people. Laverntii Beria, a longtime leader in the Soviet government began to call for a “liberal” change, citing issues such as civil rights, the release of prisoners including high-ranking officials, and the change to the Gulag system as primary concerns (Freeze, 410). The changes in Beria’s policies and his positions on large-scale issues worried Malenkov and Khrushchev, and they united against Beria as they deemed him too powerful and popular with the most influential people. This united front officially began on June 26, 1953, where a meeting was called to discuss the, “criminal anti-party and anti-state activities of Beria.” The main result of this meeting was the arrest of Beria and his main supporters (Freeze, 410-411). It was on July 8, 1953 that Beria was tried and examined by the Central Committee for the third round. In this committee meeting, Khrushchev and Malenkov and their other allies testified against Beria’s actions and accuse him of being anti-Soviet and of greatly harming the state. For example, Comrade Shatalin stated that, “Beria had become so impudent, that he began to obviously circumvent at least the apparatus of the Central Committee. In many cases he appointed and removed people without permission from the Central Committee (“Beria is Condemned).” Comrade Shatalin further attacked Beria’s character by commenting on his many affairs and relations with women and summarized the entire committee feelings on the entire matter and Beria with, “What does this rogue care for the interests of the State (“Beria is Condemned).” It is important to note however that Beria had served under Stalin for over ten years and had performed the darkest actions of the Soviet government awhile serving as the head of the secret police. He was linked to concentration camps, mass deportations, and numerous purges, as well as other jobs assigned to him by Joseph Stalin (Deutscher, 235). One can state that Beria did act in the interest of the State while acting in his own interest, but that his ambition and the desires of his political opponents to not see him in power led to his downfall. Six months after he was arrested, Beria was pronounced guilty and executed (Siegelbaum). This left Malenkov and Khrushchev as the two remaining contenders as Stalin’s successor, and their primary competition for power revolved around development and industry. Khrushchev was in favor of developing and investing in the Soviet agriculture, which had previously been ignored and under former leaders. He wanted to cultivate lands which had previously never been farmed before to increase production of food such as wheat to fight against the still persistent hunger the citizens of the Soviet Union faced. Malenkov on the other hand wanted to divert resources form agriculture and focus on light industry and the production of goods (Freeze, 411-412). It was not until mid-1955 that the “collective leadership” officially ended with Malenkov’s resignation. In his resignation statement, Malenkov noted that, “It is now evident what important role this reform played in the task of developing agriculture (“Malenkov Resigns).” This statement, Khrushchev’s emphasis on agricultural development, and his own support from government officials and the common people allowed for Nikita Khrushchev to succeed Stalin, albeit without his large personal following and demigod like status. By signing the Treaty of Brest-Litovsk on March 3, 1918 the Soviet Russia gave up its territorial claims to the Baltic region, Ukraine, and other parts of Eastern Europe to formally end its participation in World War I. As previously stated in my second blog post, this allowed for the Bolshevik leadership to focus on their domestic issues without having to concern itself with a two-sided war, thus allowing them to solidate their leadership and authority within the Soviet Union. It was not until the eve of World War II in 1939 that the question of regaining the lands they had previously lost entered the minds of the Soviet leadership, and it was only because of the influence that they decided to align themselves with Germany, the nation that forced them to give up their territories 20 years prier. This Non-Aggression Pact between Germany and the Soviet Union began in late August of 1939 with the goal of territorial expansion in the lands of Poland. This Pact allowed for Germany and the Soviet Union to both invade and then divide the lands between themselves for the purpose of expanding their borders and increasing their economic and farming capabilities (Siegelbaum). This same idea led to the Soviet Union invading and occupying the Baltic states of Latvia, Estonia, Lithuania, which had only recently achieved their independence later that same year. With the invasion and quickly following annexation of the Baltics, the Soviet Union had regained most of the territory it had lost during the World War I.
German and Soviet Soldiers (1939). September 20, 1939. Soviethistory. 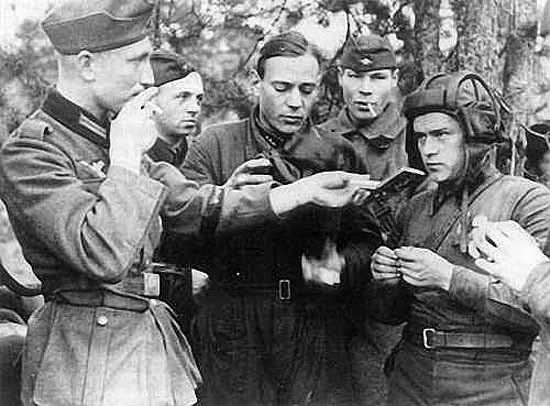 In the beginning, the Soviet Union used the pretext of housing soldiers during World War II in the Baltic states as an excuse for being there with large amounts of soldiers. The Soviet Union had forced the Baltic nations to sign in late 1939 a treaty permitting it to establish and house military garrisons, naval bases, and air bases in their lands (Kochavi, 173). A year later in August 1940, Latvia, Estonia, and Lithuania were officially annexed by the Soviet Union and proclaimed as Soviet Socialist Republics. It is important to note that with these annexations, the territory of Bessarabia, and with the eastern part of Poland gained in the 1939 partition, that the Soviet Union added around 150 to 300 kilometers to its western border (Freeze, 378). This is significant as it shows that the Soviet Union had built up its eastern front and strengthen its western border against potential invaders, who would ultimately be Nazi Germany in 1941, its former pact-mate. With this act, Germany violated the Treaty of Non-Aggression by directly attacking the USSR, despite pledging not to do so (Treaty of Non-Aggression). Baltic Sea- Map and Details. Worldatlas. Web. 25. March. 2018. As the Soviet was annexing these territories, World War II was occurring with the Soviets posed to side with the Allies after it was invaded by Nazi Germany. The alliance between the United States, the Soviet Union, and Great Britain almost did not happen because of the surrounding controversy of the Baltic states being part of the Soviet Union. British foreign minister Eden had met with the Soviet leader Joseph Stalin in December 1941 to discuss their alliance against Germany with the official recognition of the Baltic states also being a central topic. Foreign Minister Eden was in favor of accepting the Baltics as Soviet republics as it would give support to their alliance with the Soviet Union. British Prime Minister Winston Churchill, was of the opposite opinion, until he came to the conclusion that doing so would risk alienating the Soviet Union (Kochavi, 173). The real political opposition to the Soviet demand was from the United States and its President Roosevelt, who did not want to recognize the Soviet annexation of the Baltics as being official and legal because of the Atlantic Charter. They objected to the forceful annexation with the Atlantic Charter, which proscribed territorial changes, “that do not accord with the freely expressed wishes of the peoples concerned (Kochavi, 173).” With this refusal by the United States, Great Britain was not forced to accept the Baltics as legal territories of the Soviet Union. The power of the United States kept the Soviet Union from receiving the official international recognition of its territorial gains, which it had long since desired to signify that the international community viewed it as valid (Kochavi, 174-175). The entire issue and question of the Allied forces accepting the Soviet annexation of Latvia, Lithuania, and Estonia as truly being new satellite states of the Soviet Union could have potentially cost them an alliance. The United States and the other Allies did not approve of the Soviet Union’s forced territorial gains in the Baltics and other parts of Eastern Europe, but were forced to deal with it to appease Stalin and keep the USSR as an ally during World War II. 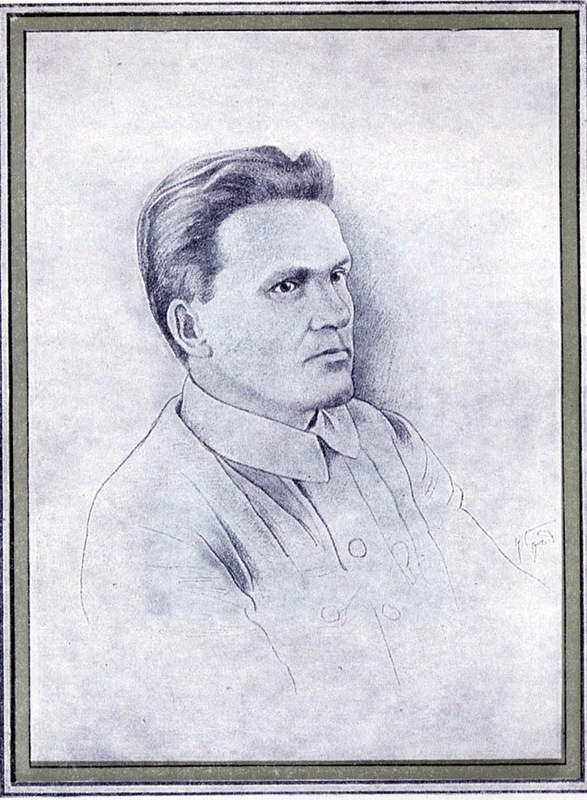 On 1 December, 1934 Sergei Mironovich Kirov was murdered at the Smolnyi Institute in St. Petersburg by Leonid Nikolaev, a former party member. The 48-year-old First Secretary of the Leningrad party organization and longtime Bolshevik member was assassination only months after he had received a higher percentage of votes in the elections to the Politburo at the Seventeenth Party Congress than Joseph Stalin (Freeze, 364). Isaak Brodskii. “S.M. Kirov Secretary of the Leningrad Provincial Committee of the Communist Party.” The Kirov Affair Images. Soviethistory. 1929. Web. 18 March. 2018. Sergei Kirov’s death became a political sensation for the Bolshevik party because of the murder of such a prominent political figure. For days after the event, radio broadcasts and newspaper devoted time to mourn the death of the politician. They also denounced those responsible for the assassination and focused on the alleged perpetrators of the crime. These newspapers also called for national support for the Bolshevik Party by stating that the attack on Sergei Kirov was not just about him, but about the entire Bolshevik Party and the proletariat revolution (Knight). In rural areas local party leaders organized meetings for workers, peasants, students, and others to mourn the death of Kirov together. As this was occurring, these local leaders were also asking for donations of either money or labor to support his memory (Rimmel, 481). Kirov’s death did not provoke the same intense, mournful response from the common people. These people, mostly those living in rural areas, were not concerned with the assassination of a powerful politician, as they were focused on their lack of food and growing hunger. The general population did not see the events as terrible news or something to be too concerned with, as they viewed the Soviet government and Kirov himself with hostility. With Kirov’s death, they focused more so on the failures of the Party and Communism to help combat their mass hunger than on Kirov himself. (Lenoe, 353). Nikolay Tomskiy & Noy Trotskiy. 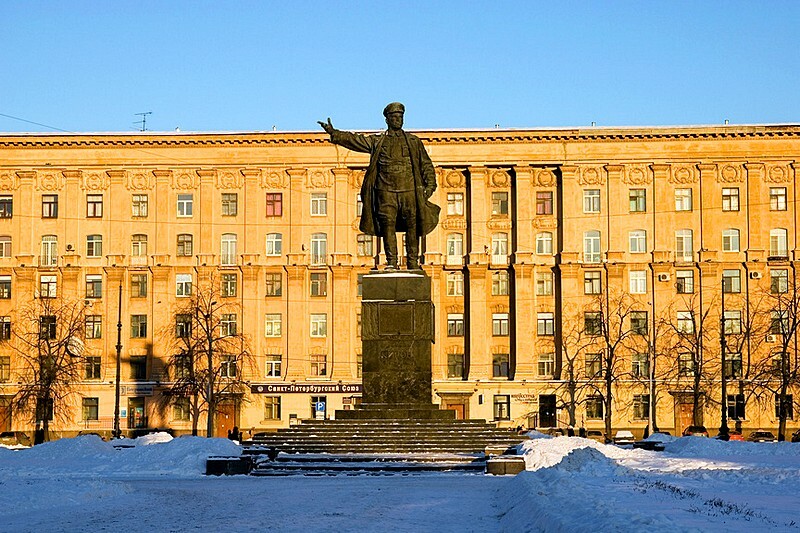 “Monument to Sergey Kirov on Kirovskaya Ploshchad.” Saint-Petersburg. 1938. Web. 18. March. 2018. While the responses from the Party members and the general public were vastly different and demonstrated the varied sentiments towards the Soviet government, the official response of Soviet leader Joseph Stalin created a sense of unity between the two groups. This was because Stalin’s response affected everyone in the Soviet Union, regardless of position, and put everyone in some form on danger. After Sergei Kirov’s murder, Stalin launched an investigation and personally oversaw the interrogation of Nikoleav, the assassin. Stalin’s report stated that Nikoleav did not act alone in this crime, and that he was supported by the Zinovievites, the supports of the disgraced former party boss Grigorii Zinoviev, the remaining members and supporters of the White Guard, and other rival ideological organizations (Siegelbaum). Stalin’s report and the resulting investigation into these particular groups is significant, as it allowed for him to eliminate and try those he deemed to be dangerous. He was able to do this without question and with the support of his mourning and angry political party, as they saw these individuals and political organizations as being an “enemy of the people.” (Freeze, 364). Historians have viewed Joseph Stalin’s responding actions to the assassination of Sergei Kirov as being suspicious because of its intensity. A result of Kirov’s assassination and the resulting actions of Joseph Stalin was the widespread and popular theory that Stalin himself had ordered Kirov’s assassination. This is a common theory, as it allowed for Stalin to use Koriv’s assassination as an excuse to investigate and purge his political opponents and those he deemed potentially dangerous to his authority (Freeze, 364-365). The resulting purge, deemed the Great Terror by historians, resulted in millions of deaths of government officials, military officers, members of the elite, those with great economic statuses, those opposed to the Bolshevik Party and Joseph Stalin, and the high-ranking members of the Bolshevik Party (Freeze, 369). This mass purge resulted in the removal on anyone who could potentially challenge Stalin’s rule and authority in the Soviet Union. Brodskii, Isaak. “S.M. Kirov Secretary of the Leningrad Provincial Committee of the Communist Party.” The Kirov Affair Images. Soviethistory. 1929. Web. 18 March. 2018. Tomski, Nikolay & Noy Trotskiy. “Monument to Sergey Kirov on Kirovskaya Ploshchad.” Saint-Petersburg. 1938. Web. 18. March. 2018. With this declaration in the Constitution of the U.S.S.R in 1924 the Bolsheviks stated that women would be considered the equal to men in society and in the eyes of the law. Their concern with the roles of women stemmed from their visions of revolution and the necessity for a complete upheaval of societal institutions, traditions, and values. The reorientation and changes of the roles of women were considered one of the most important steps in building the new nation as it would involve part of the nation that had previously been excluded politically and socially. With the creation of the Zhenotdel (Women’s Department) in 1917 the Soviet Union had established a political organization run by women, for women. This organization along with the main government helped to change the rules and regulations placed on women by making them equal to men under the law. Marriage was also removed from Church control and could only be legally accepted and performed by a government official. Divorce which had previously been controlled by the Church was now under the authority of the government. Divorce was also something which women could ask for without requiring permission of their fathers or husbands. The ability to divorce their husbands was the most significant change for Soviet women, as they did so in droves. Divorce was also the most successful Bolshevik policy for establishing a true revolution as it aided in creating gender equality and removing some of the patriarchal authority that came from marriage. Most importantly however, was the fact that divorce gave women new abilities in her life to be something besides a wife or a mother. Despite all of these gains for women, the Soviet family system risked its traditional structure and the protection of its most vulnerable part: the children. With women being able to get divorced, many were forced to raise their children by themselves with only one paycheck. While child support or alimony was supposed to be given by the father, it was difficult to collect as fathers could run and hide or challenge their paternity over their supposed child. Soviet changes to the societal position of women and its own inabilities to create an alternative childcare system as a proper replacement effected the ability of children to receive proper care. Despite the intent of the Soviet government to create a welfare system that would allow for mothers to work and their children to receive care from government sponsored daycares, the Soviet Union lacked the resources to do so. Thus, the Soviet Union could not be the type of welfare state that it advocated for and those in the most vulnerable positions suffered as a result. To help educate the Soviet youth on Bolshevik ideology and teach them skills needed for future work, organizations such as the Komsomol, or the Young Communist League were created. The Komsomol was tasked with helping to create a generation of the “New Soviet Man,” which would be literate, understanding of life and society, and knowledgeable of the skills needed to be a successful worker and countryman. With these lofty goals came several issues that the majority of government sponsored programs faced: A lack of funding. The inability of the Bolsheviks to fund these youth organizations and the constant harassment and discrimination the female members faced helped to enforce gender norms that the Soviet Union wanted to do away with. With limited funding the Komsomol and related schools were forced to have fees for students to become members and participate. With this system, prevailing gender norms continued as parents would enroll their sons instead of their daughters at higher rates, which limited the potential education and skills daughters would need economic security. 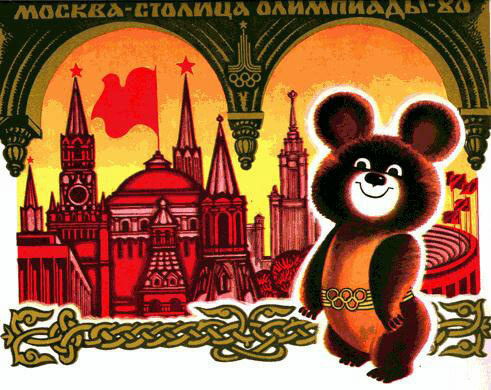 The issue of gangs and illegal activities amongst teenagers was also placed upon the Komsomol by the Soviet society. The Komsomol was criticized for not being able to control underage drinking, smoking, and fighting, while also promoting something positive for the Soviet youths to focus on. Mark G. Field states in his work that drinking and smoking were not only problems associated with the youth in the Komsomol and other organizations, but that they were widespread issues that affected everyone from the upper-class to the white-collar workers to the rural farmers. Field argues that the combination of the Russian drinking culture and the effects of industrialization led to the increase in underage gang activity. Because of industrialization family functions began to disappear with the need to work more for wages. Thus, fathers were out of the home more, while women began to enter the job market in droves to support their families. He states that this removal of family functions and parents at home left children without proper role models to teach and guide them. The result of this was male teenagers having to discover their own version of manliness, which mimicked their fathers and older Soviet workers, which included the common habits of hard drinking and picking fights with strangers. Stalin Society of North America, “On Women’s Rights and Abortion in the USSR,” Stalinsociety, Web. 25 Feb. 2018. Gregory L. Freeze, Russia: A History, Third Edition. (Oxford: Oxford University Press, 2009): 329. James von Geldern, “The New Woman,” Soviethistory, Web. 25 Feb. 2018. Sean Guillory, “Revolutionary Manliness,” Soviethistory, Web. 25 Feb. 2018. Mark G. Field, “Alcoholism, Crime, and Delinquency in Soviet Society,” Social Problems Vol 3. No., 2, (1955): 101. Field, Mark G. “Alcoholism, Crime, and Delinquency in Soviet Society.” Social Problems Vol 3. No., 2. (1955): 100-109. Freeze, Gregory L. Russia: A History. Third Edition. Oxford: Oxford University Press. 2009.